By the time Heroes of the Elemental Chaos came out, D&D Next had been announced, so I’m not sure this book got the attention it would ordinarily have received, despite being the first D&D book released in 2012. Since then, we’ve learned that this Player’s Option title is almost certainly the penultimate 4e book from WotC, so we’re unlikely to get a Heroes of the Astral Sea now. The main reason I wanted to pick up this book was that the sha’ir was back. I loved Al-Qadim and so was very interested to see how 4e would handle what is a very cool but (tricky to execute) concept. There have also been several genasi in the Parsantium campaign (the infamous Juma Ji’ad, Margarita the watersoul warlord, El’em Terazz the stormsoul wizard and Mal’uk the watersoul swordmage) and kb98 played one in Lands of Intrigue, so I was looking forward to some interesting options for that race. Finally, I’ve been thinking about trying to do something with the genies of the Elemental Chaos for a while. I’m not sure about the plane itself to be honest – more about this in my post for If I Ruled The Multiverse – but I have a packed City of Brass boxed set from Necromancer Games and Wolfgang Baur’s Secrets of the Lamp on my shelf so have quite a bit of material for a genie-focused Arabian Nights-flavoured adventure. So, on to the book itself. 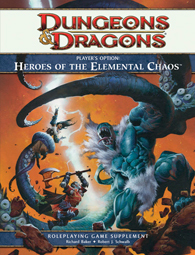 Heroes of the Elemental Chaos is a 160 page hardback book, following a similar structure to the earlier books on the Feywild and Shadow, beginning with a DM-friendly section on the nature of elemental power, then moving on to three chapters of player-focused content – themes, new powers and class builds, paragon paths, epic destinies, feats and rewards, all linked to elemental magic. The first chapter is my favourite, including lots of DM and player background on elemental magic, the elemental-touched races and the mighty primordials. There is a very interesting section on the Elemental Princes, first introduced in the original Fiend Folio, and brand new info on both bound and free primordials. There’s a handy roster listing the known primordials too – this two page list is full of great names from D&D history like Bwimb (Baron of Ooze), Ubtao (from the jungles Chult in the Realms) and the Queen of Chaos. The player content starts on p.36 and, although there’s a lot of good content, I did start to wonder how many more themes, powers and feats we really need. Short sidebars on various elemental organisations and “viewpoints” from element-wielding characters are dotted throughout the pages of crunch to break things up a bit, and like the earlier two books in this series, there’s more focus on story, but I did feel at times like one page was blurring into the next. Unlike the Feywild and Shadow books, there are no new races – I suppose the genasi and githzerai have already been done but maybe azer or mephits could have worked? As an aside, I wonder why we haven’t seen official mephits in 4e – there were a few in Halls of the Mountain King but these were unofficial 3.5 conversions. It’s always nice to see original Fiend Factory monsters transcend editions – oh well. The 10 themes are mostly focused around the four elements but there’s also a Demon Spawn here which serves as a jarring reminder that the Abyss is in the Elemental Chaos too and not with the rest of the Lower Planes where it belongs! The other one that stands out for me is the Janissary – a PC taking this theme is branded as part of a genie’s entourage, fighting in service of his master, which strikes me as having a lot of adventure possibilities. The sha’ir is the highlight of this chapter. I’ve played one of these wizards at 1st level for a couple of sessions in ninthcouncil’s 4e Wilderlands campaign and I’m enjoying having an efreetikin sidekick helping me out in battle. The spell-fetching concept from 2e Al-Qadim has been retained – the gen can venture into the Elemental Chaos during an extended rest and bring back a different daily attack or utility power for you to replace one you have of the same level. This gives the sha’ir a lot of flexibility but there are now so many powers available for wizards that it will be hard to know what to pick each day! Fortunately at 1st level, the options are more limited, but there are still 21 daily powers in the Compendium to choose from! What has gone are the genie-summoning powers that 2e sha’irs got at higher levels – at 5th level, a 2e sha’ir could call upon the jann for aid (no jann in 4e!) and at 9th level she could try and summon a djinn, dao, efreet or marid. 4e genies are much higher level so this was clearly not going to work the same way. Instead, we get the Prince of Genies paragon path – the character finds a bottle with a genie inside which she can call upon for aid, including a limited wish at 12th level (to regain an expended encounter power, turn a hit into a miss etc). The text describing the paragon path is fairly dry but a good role-player should be able to have a lot of fun bringing their genie to life. The Favored Sha’ir is also a good paragon path option, allowing the sha’ir to retreat to an elemental safehouse in the heat of battle at level 11, and to unleash a powerful elemental monolith at level 20. One of the epic destinies looks very cool too – the Emergent Primordial is well-named, allowing the character to turn into a Huge primordial at level 26. Next, we get plenty of feats including several Elemental Companion ones. These give a PC a fun elemental sidekick with flame serpents, magmin, mud wretches and pech among the options. There’s an odd picture of a pech in this section though – it looks much more fiendish than I imagined. Rounding out the book we get a bunch of elemental rewards, including some very nice weapons, primordial shards and tomes, including a “lite” (incomplete) version of the infamous Demonomicon. Overall, this is a good book for anyone wanting to add some new options into their 4e D&D game. It’s not as imaginative as Heroes of the Feywild but there’s a lot of solid content here, and the sha’ir and elemental companions in particular are great. I love elemental themed heroes, but I began to love them even more after this book! To me, the big highlight was the Elementalist, also as a mechanical proof-of-concept: a spellcaster that manages to be as easy and straightforward as a classic Fighter! It is a direction I like very much for the Sorcerer because it makes it really different from the Wizard. I understand that the term "Sorcerer", speaking of English language, is not THAT tied to elemental magic... But the Elementalist truly is a concept that could be completely separated from the Wizard. The spontaneous casting for which the Sorcerer began to be famous in D&D is something that could even just be a special Wizard tradition, but a spellcaster that truly has magic inside his body and hurls it (and MORPHS it) with the simplicity of a warrior swinging his sword? Now that's something not wizardly! I hope I'll be able to give a lot of feedback on the next version of the D&D Next Sorcerer so as to propose an Elementalist direction. Re: One of my favorite books! Good point about the elementalist - the fact that his blast powers improve (escalate) as he goes up levels, rather than gaining lots of new encounter and daily powers, is pretty cool. Nice, simple spellcasting class for someone who likes dishing out damage.